Do you have a kid’s birthday coming up? Stuck for ideas for the half-term holidays? Maybe you’ve considered booking a paintball event for your child but are unsure of the differences between regular paintball and mini paintball? Mini paintball (or mini-ball) caters to young children aged between 8-10 years. As opposed to adult paintball, the day is slightly shorter (typically 3-4 hours) and all kids are provided with a smaller, lighter gun that fires less powerful paintballs with a softer impact. We want all kids to enjoy the day just as much as the adults, which is why every mini paintball player will get to experience the exact same missions as the adults. Whether they’re protecting the president in our London Apocalypse game zone or rescuing a stricken airman in ‘Jungle Attack’, they are sure to go away with memories that will last a lifetime. As well as being super fun, mini paintball can be incredibly rewarding. Kids will learn to compete, gain new skills and work together to overcome challenges, all while keeping fit and getting some much needed fresh air! Over the years mini-ball has proven incredibly popular for family outings, school trips and in particular, birthday events! We have fully trained marshals who are more than happy to assist you and your mini soldiers throughout their day, as well as keeping them safe. 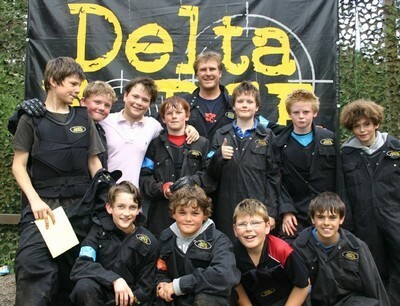 Delta Force Paintball is a five star accredited member of the UKPBA (the governing body for paintball in the UK) and all of our centre managers and paintball marshals are fully trained in first aid. Every child will be covered head-to-toe in Delta Force’s state-of-the-art paintball gear, including US-spec full head protection goggles and camouflage combat suits with padded collars. One last thing – be sure to bring your cameras as many of our centres have genuine Hollywood props, such as the helicopter from Hollywood blockbuster Edge of Tomorrow, starring Tom Cruise. A pretty awesome prop to capture, right?! Click here to see our mini paintball prices and full mini paintball itinerary. Are you interested in booking a mini paintball day? To speak to one of our friendly event coordinators, simply call us on 0203 869 9301. Our phone lines are open 24/7. Alternatively you can request a callback by visiting our paintball booking page. We look forward to seeing you!